Make a bold statement with the Kraus Kitchen Combo, feat. Geo Arch. The unique two-tone faucet has striking black insets that complement the colour of the sink. An EZGrip dual-function pull-down sprayhead provides flexible functionality. The KGD-412b 31 1/5" sink is made with 80% natural granite, for the look and feel of real stone. Choose from top mount or under mount installation for seamless style. A matching soap dispenser is included. Experience Kraus Quality, and create a kitchen you love. 31.2 Inch. Dual Mount Single Bowl Sink W/ Pull Down Faucet & SD Stainless Steel Make a bold statement with the Kraus Kitchen Combo, feat. Geo Arch. 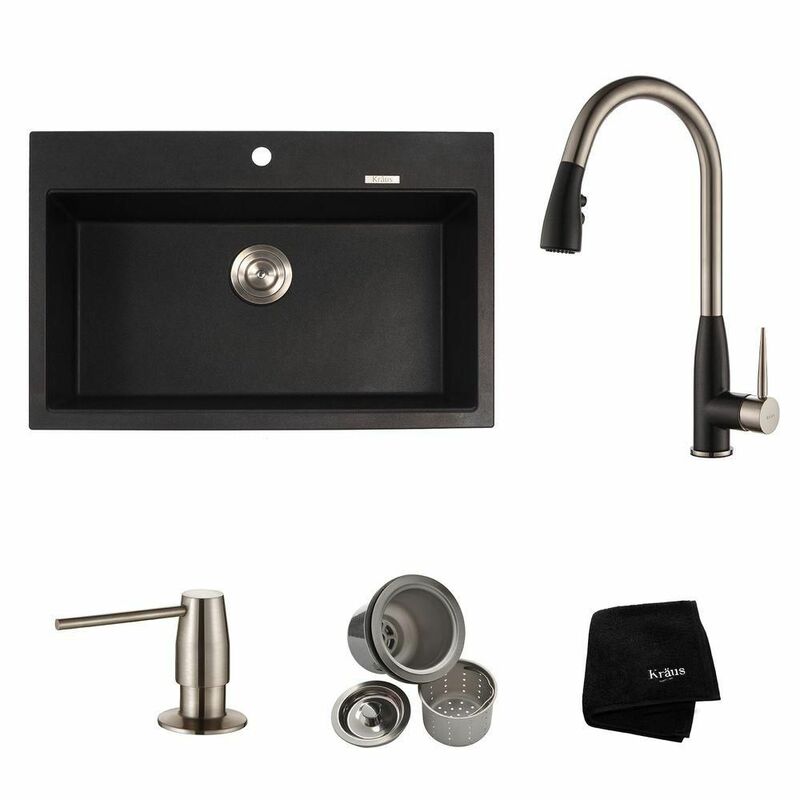 The unique two-tone faucet has striking black insets that complement the colour of the sink. An EZGrip dual-function pull-down sprayhead provides flexible functionality. The KGD-412b 31 1/5" sink is made with 80% natural granite, for the look and feel of real stone. Choose from top mount or under mount installation for seamless style. A matching soap dispenser is included. Experience Kraus Quality, and create a kitchen you love. 31.2 Inch. Dual Mount Single Bowl Sink W/ Pull Down Faucet & SD Stainless Steel is rated 4.7 out of 5 by 21. Rated 5 out of 5 by Penny from Was exactly what I was hoping to be and more.... Was exactly what I was hoping to be and more. Rated 5 out of 5 by Doogie from Beautiful sink! My wife and I both love this sink! It's beautiful, and big enough to hold our largest pots, pans, and cookie sheets. The siligranite has held up well so far. Love the matching faucet as well. It's similar in function to your standard pull-out kitchen faucet with the added bonus of complimenting the sink. The strainer basket for the drain is a great touch; this is our first sink to have one and we love that feature too! Overall, just a beautiful, functional sink that compliments our kitchen nicely. Rated 4 out of 5 by Ebun from install easily by the installer, looks beautiful and meet my expectations, easy to clean too. install easily by the installer, looks beautiful and meet my expectations, easy to clean too. Rated 5 out of 5 by cstez from I love it! Was initially worried it might scratch but no problems so far. It looks great with the... I love it! Was initially worried it might scratch but no problems so far. It looks great with the black stainless appliances. Rated 5 out of 5 by TT from Loved the sink! It’s really a beautiful dark black color... Loved the sink! It’s really a beautiful dark black color and when the light hits it just right you see what look like flecks of silver and blue. The single sink is deep. I don’t have any problems washing large pans. top mount ok? Listed as dual mount so want to be sure.